It was monthly card show day today and although I didn't come across any new Linden cards to add to the collection, it was really nice to see a bunch of new "stuff" on tables that normally have a bit too much of the "same ol' stuff". I was tempted to splurge on a couple bigger ticket cards but a recent appointment with my financial guy had me hearing his voice in my head a little louder than normal. Probably a good thing. But that doesn't mean I didn't find something to come home with. 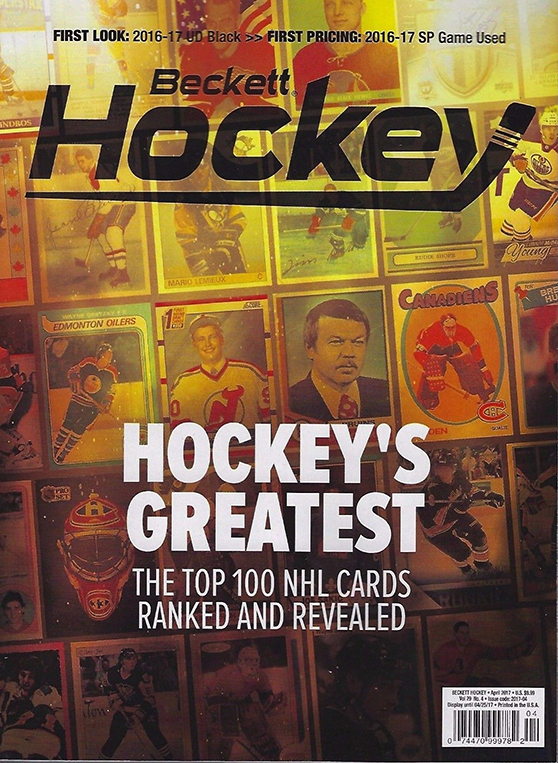 First (and most surprising) would be the latest issue of Beckett Hockey. I can honestly say that I haven't paid for a Beckett mag in years. It's just turned into too much "price guide" (and I use that term a little loosely) and not enough articles. But the cover of the most recent issue had me considering an exception. Alright.....you have me interested. I'm a sucker for a good list and I guess when it comes to hockey cards, this would be the ultimate one (although I bet I could come up with some pretty sweet lists of my own). And I love the way the cover looks. Super simple design but the gold light overlay just really caught my eye. Very nice. So I bought it. I won't divulge anything regarding the items on the list (as I would recommend you go and pick up a copy to check it out) but I will say that there were a number of cards that had me surprised. I would assume a number of iconic pieces of cardboard be on the list but there were many that I never....NEVER would have considered. I like that in a good list. A decision is made, an argument is presented and a list is formed. Kudos. Sadly, there wasn't much else in the magazine that caught my eye. It's just not like it used to be back when the magazine was born in the early 90's. The "Hot List" made me laugh though. Every single one of the 20 cards presented were either Young Guns or YG Canvas cards....say for one - and it was a Canvas card. Boy.....I feel like the hobbyists are predictable these days. Where's the variety? Where's the fun? Are we all just supposed to go and get our Auston Matthews or Patrick Laine YG and just call it a day? I guess so. But I digress..... on to the card pickup at hand. One new add and it was an automatic when I saw it. 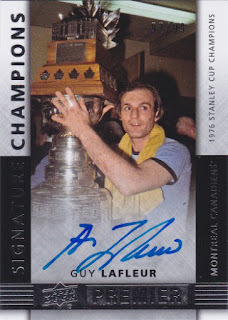 This Guy Lafleur Signature Champions card is one I have seen a number of times online but never took a stab at. His signed stuff feels a little off-kilter to me. The guy is a legend....but he doesn't seem to have the hobby love that one would expect. Original Six team, hugely popular in the 70's and early 80's, successful and loved by the fans. So what gives? Is it the fact that played second fiddle to Gretzky in the latter portion of his career? Too many great Habs back in those days? Outside of Montreal is he even on anybody's radar? Regardless, I've been waiting for the price to be a reasonable one before I struck. The price tag on this one today made the decision easy. Simply put, I paid less for this card than I did for the Chris Chelios one a couple weeks back. My only beef with the card would be that Guy isn't hoisting the Cup over his head. 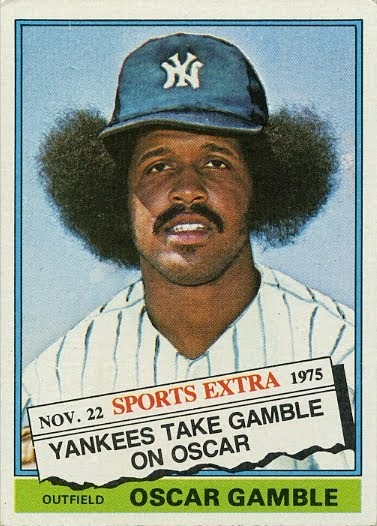 But I guess that wasn't the big thing to do back in the 70's like it is today. And the Conn Smythe trophy balanced above The Cup just steals the thunder from what should be a pinnacle moment (actually....the yellow towel does that pretty well too). One more off the list. Starting to get to a point where it's the tougher ones left on my list. But I knew that going in. Love that Lafleur! I've never understood why he is so underrated in the hobby. I refuse to give Beckett my hard earned cash but MAN am I tempted to see that list! Sweet card. Nice shot with the Conn Smythe trophy which doesn't make an appearance on many cards. You're right, The Flower doesn't seem to garner any hobby love. But man, was he great.